Home > Blog > Is American Agriculture Prepared to Tackle Climate Challenge? Is American Agriculture Prepared to Tackle Climate Challenge? This is reposted from the National Sustainable Agriculture Coalition, of which CalCAN is a member. The 4th National Climate Assessment – “Impacts, Risks, and Adaptation in the United States,” released by the Administration just after Thanksgiving, underscores the very real climate change-related challenges that American producers can expect to face in the coming years. The extensive report includes a close examination and peer reviewed analysis of the implications for agriculture across the country, including opportunities to adapt and contribute to mitigation. The findings and warnings of the National Climate Assessment are also supported by several other scientific reports published recently. No less than 2 months ago, the United Nations’ Intergovernmental Panel on Climate Change (IPCC) released its 15th special report, which outlined the dire impacts of global warming 1.5 °C above pre-industrial levels. American family farmers and ranchers are already feeling the negative impacts of climate change on their livelihoods; many have lost crops, income, and even their entire operations because of severe floods, extreme heat and drought, and increased pressures from changing disease and pest patterns. Given the consequences of inaction, we must ensure that those on the frontlines have the tools they need to adapt to the effects of a changing climate and mitigate their contributions to it. Every four years, as mandated by the Global Change Research Act of 1990, the interagency U.S Global Change Research Program presents an assessment on the domestic impacts of climate change – including its impact on agriculture – to the President and Congress. Reduced Agricultural Productivity – Higher temperatures will lead to higher frequency of droughts, lower crop yield, depletion of surface and groundwater resources, increased risk of wildfires, and overall lower soil health. 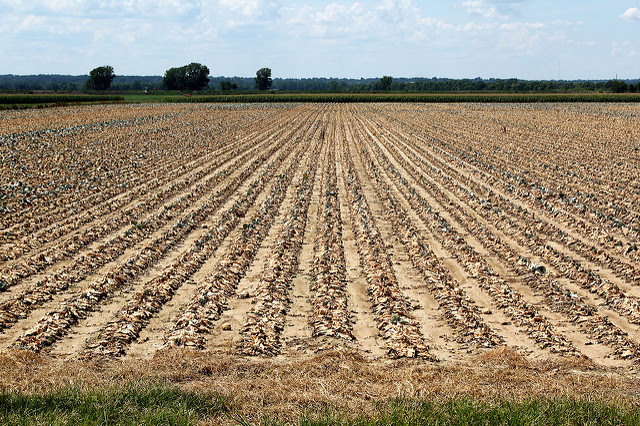 Degradation of Soil and Water Resources – Climate change will increase the frequency of extreme precipitation events which in turn will lead to further soil erosion on working farmlands. Health Challenges to Rural Populations and Livestock – Marginalized populations living in risk-prone rural areas have a higher propensity for heat related health consequences. Livestock will also suffer from heat stress and reduced feed availability, resulting in an overall decline in production. Because of their inherent connection to, and dependence on the land, farmers, ranchers, and rural communities will most suffer the consequences of inaction on climate change. We are not without options, however. Improving our soil and water management through conservation activities – support and assistance for which are offered through federal conservation programs like the Conservation Stewardship Program (CSP) – is a key way that we can reduce and mitigate the effects of climate change on local ecosystems. Programs like CSP increase producers’ ability to benefit from climate adaptation activities, and also enhance their efforts to cultivate more resilient communities into the future. Although agriculture is one of the main contributors to the nation’s total greenhouse gas (GHG) emissions, the industry is also uniquely poised to contribute to mitigation efforts through carbon sequestration and reductions of GHG emissions. According to the Climate Assessment report, “rural residents and the lands they manage have the potential to make important economic and conservation contributions to climate change mitigation and adaptation.” Examples of advanced conservation practices that contribute to these efforts include diversified crop rotations, cover crops, and other forms of conservation cover. Farm bill conservation programs like CSP are critical tools in supporting farmers in implementing these activities and increasing the sustainability of their operations into the future. However, given the House’s recent efforts to eliminate CSP and cut conservation funding in their draft farm bill (released earlier this year), farmers’ abilities to implement much-needed conservation activities remain in danger. With the next farm bill reported to be completed in the coming days, the National Sustainable Agriculture Coalition (NSAC) will be looking closely at the pending conference report to see if and to what extent Congress invests in conservation programs like CSP and other activities that support climate adaptation and mitigation. Assuming the 2018 Farm Bill is signed into law by the end of the year, careful stewardship of farm bill implementation will be needed over the next five years to ensure that federal programs and policies support climate change mitigation and adaptation efforts to the best of their abilities. The 15th IPCC Special Report, released earlier this fall, also makes it clear that the severity of climate challenges we face in the years ahead will continue to increase. However, the report also underscores that actions taken now can prevent us from suffering the worst effects of global warming. According to the IPCC, the risks to natural resource and human health are higher at a 2°C increase in global temperatures than a 1.5°C increase of warming. Given that most climate models predict that the world must reach zero net emissions by 2050 in order to cap global warming at 1.5°C, the work ahead for the 116th Congress is significant. Several climate change-focused efforts – including the Climate Solutions Caucus and the Green New Deal– are already underway in Congress. The enthusiasm of Congress Members-elect like Alexandria Ocasio-Cortez (D-NY) and Ayanna Pressley (D-MA) is an encouraging sign of what we can accomplish on this front in the years ahead. There are also, of course, many existing champions of climate-change action and sustainable agriculture in Congress, including on the House and Senate Agriculture Committees. We were enthused to hear, for example, that Chairman of the Senate Agriculture Committee Senator Pat Roberts (R-KS) recently stated that he’s interested in holding a hearing next year focused on climate change and agriculture. NSAC looks forward to working with our historic champions for sustainable agriculture and cultivating new allies among the incoming class of freshmen. The next several years will be crucial for climate action not only at the national level, but also globally. Countries around the world are currently preparing for the 24th Conference of the Parties (COP 24), for example, which will be held next week in Katowice, Poland. At COP 24, countries, businesses, and civil society, will negotiate the agreements of a rulebook to enforce the compromises agreed in the Paris Agreement at COP 21. Unfortunately for the United States, the Trump Administration has pledged to pull out of the Paris Agreement – making it the only country in the world to do so. Whether or not the U.S. moves forward with the countries active in COP 21 and COP 24 will have major ramifications for our ability to guide and participate in climate change mitigation efforts internationally. In addition to the reports mentioned above, farmers and ranchers interested in sustainable agriculture and conservation activities should also check out NSAC’s Grassroots Guide to Federal Farm and Food Programs. The U.S. Department of Agriculture’s Sustainable Agriculture Research and Education Program(SARE) also recently produced a report “Cultivating Climate Resilience on Farms and Ranches”, which details ways that producers can assess their exposure to climate change-related risk. The SARE report also offers recommendations on how operations can become more resilient and better manage their resources for the future.